Does Your Chihuahua Have Extra Or Retained Puppy Teeth? Every dog owner should have a habit of looking into their dog’s mouth, particularly Chihuahua owners and those who own toy breed mixes and other small dogs. Small dogs have tiny mouths that tend to be overcrowded, making them more vulnerable to tartar buildup and dental diseases. 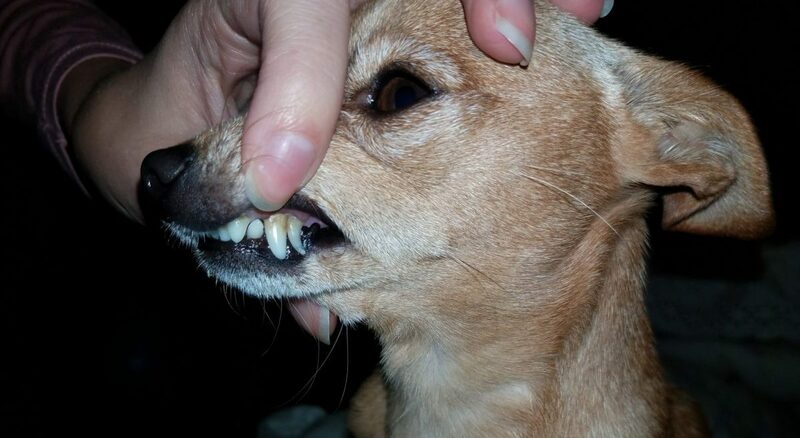 To make matters worse for our little ones, some Chihuahuas have retained puppy teeth. By the time your Chihuahua is 9 months old, all of her puppy teeth should have fallen out, and been replaced with larger adult teeth. Sometimes the puppy tooth does not fall out, and the adult tooth grows in next to it. As the adult tooth grows in beneath the puppy tooth, it actually dissolves the roots of the puppy tooth. Fascinating, but troublesome if the adult tooth comes in next to it – the roots of the puppy tooth may remain, keeping it firmly in place, so no amount of tug-o-war or bone-chewing can dislodge it. Just surgery. The retained puppy tooth and adult tooth may be positioned right next to each other, or even overlap. This closeness can make it very difficult for tartar to be dislodged with regular chewing or brushing. Also, the adult tooth will not be able to grow into the correct position. This can lead to tooth or gum trauma leading to possible infections of teeth or even the nose. Dental problems can begin just weeks after the adult tooth comes in. So, you don’t want to wait to have those puppy teeth extracted. Before she reached a year old, Matilda had four retained canine teeth. All but one eventually fell out. She still has this retained puppy tooth, and I’ve been struggling to keep tartar from building up between the adult tooth and the puppy tooth. I thought this was the only issue. I thought that if I kept that area clean, and as long as the gums above it did not seem swollen, she would be fine. And so far, she has been. She eats her food and has never seemed to be in pain from her retained puppy tooth. But she’s three years old. When her puppy tooth is extracted, her adult tooth will remain in that unnatural position. I truly regret not having her puppy tooth extracted sooner. Veterinarians have never mentioned it during exams, and they have looked inside her mouth, but I only have myself to blame. I should have taken care of this sooner. Nonetheless, if you’re in the same position as me, don’t be too hard on yourself. Instead, take action. Pick up the phone right now (or, if it’s after-hours, set a reminder on your phone for tomorrow morning) and call your vet for an appointment. Just do it. Next week, Matilda is having bloodwork in preparation for her spay surgery. I’m going to have the veterinarian perform the extraction at the same time, if possible. My reason for procrastinating has been my fear of letting Matilda get put under. Small dogs are especially vulnerable to complications from anesthesia. However, if I don’t have the tooth removed before it becomes painful, she may eventually need a more complicated surgery, plus treatment for an infection that could even be fatal. While I’m worried about the procedure, I realize it’s routine. I’m optimistic that Matilda will recover quickly, and that it will be much easier for her teeth to stay clean. Fingers and paws crossed! I took my chi to vet. He is five but stubborn. Will eat toothpaste but not let me do a good brushing. Small mouth makes it harder to clean in the back. I feel he is worth vet doing it and taking care of him like a person. Same cause for my Cat.